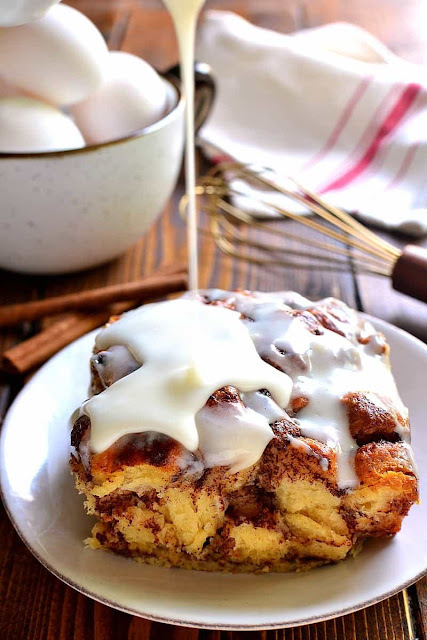 Cinnamon Roll French Toast Casserole takes cinnamon rolls to the next level in an ooey, gooey, delicious baked French toast recipe that’s perfect for the holidays! So do you remember back in August, when Ellia asked me about the Tooth Fairy? And I really didn’t know what to say, and I wasn’t ready to tell her the truth, and I kinda hoped it would just go away? Well, apparently it didn’t. Apparently she’s been holding on to all her questions and doubts and concerns. And apparently, it’s not just about the Tooth Fairy. Can you guess where this is headed? Remove cinnamon rolls from packages and cut each roll into sixths. Drizzle melted butter in 9x13 inch pan. Spread cinnamon roll pieces evenly in pan. In a separate bowl, combine eggs, milk, cinnamon, and vanilla. Whisk until combined. Pour egg mixture over cinnamon rolls. Bake at 350 degrees for 30-35 minutes or until top of casserole is golden brown and center is set. Prepare icing by combining reserved cinnamon roll icing with 1/2 c. powdered sugar, 2 Tbsp. softened cream cheese, and 1 Tbsp. milk. Whisk until smooth. Pour icing evenly over casserole. 0 Response to "CINNAMON ROLL FRENCH TOAST CASSEROLE"